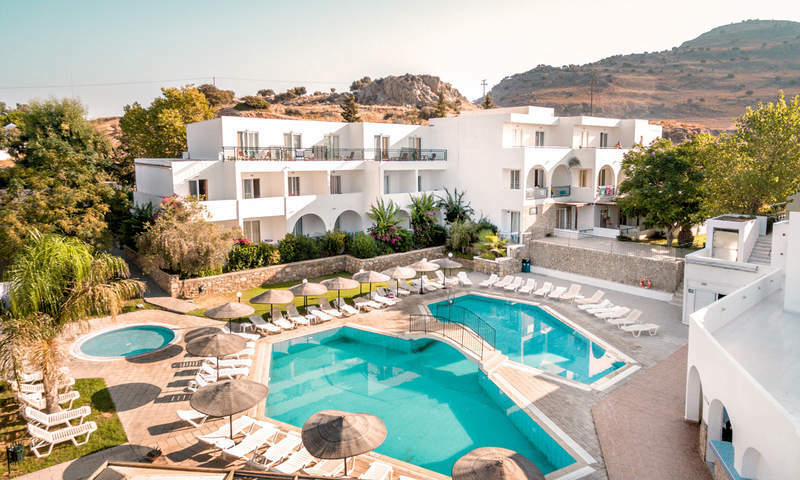 The hotel smartline Ellia is situated between the village of Lardos (1.5 km) and the town of Lindos (6 km), one of Rhodes’ most popular tourist destinations. Lothiarika Beach, a quiet and picturesque sandy/pebble beach with crystal-blue water awarded with the Blue Flag, is just 300 m from smartline Ellia. Rhodes Town with its old town designated as a World Heritage Site is in 55 km distance, the International Airport Diagoras in 60 km. We stayed at the Ellia from 27/07/16 to 10/08/16, and were very impressed, especially because we had been moved here by out tour operator, and did not know what to expect. The rooms are arranged in blocks of 2, dotted all over the grounds, giving a village feel to the place, which is nice. The rooms are quite spacious, with a double bed, and a single in a semi-separate space, and lots of storage space. The shower rooms are small, and the showers themselves particularly, but they are adequate. The air conditioning is individually controlled, and is included in the room rate. The in-room safe, however is at an additional charge (€40 per fortnight). The rooms are cleaned daily, with a linen change every 3 days, and a towel change every 2 days. The food is, for all inclusive in Greece, very good. The salad bar is exceptional, all fresh and very inviting, even to a confirmed salad-dodger like me! There are always variations on pasta, potatoes and rice, alongside a fish and at least 2 meat offerings (chicken, turkey, pork, lamb, beef & rabbit) as well as the slow cooking station most nights, doing souvlaki, gyros, burgers and so on. Drinks are self-service, with water, red & white wine, beer, cola, cola light, orangeade, lemonade and lemon/lime. Desserts are of the cake/crème caramel/jelly type, with fresh fruit (varies) and ice cream also available. The hotel itself is nicely laid out in well-kept landscaped grounds, with 2 pools, each with a pool bar, and 2 kiddies pools. There is a shop attached, with all the usual offerings, and a burger restaurant as well, which is not included in the package, but is well worth a visit. We had a great holiday here, and have already discussed a return visit. My previous review says it all, but I wanted to add some photos to give an idea of the place, and this was the easiest way to do it.